Egypt's Muslims attend Coptic Christmas mass, serving as "human shields"
Photo Gallery: Egypt's Muslims attend Coptic Christmas mass, serving as "human shields"
How afraid are Egypt's Copts? Among those shields were movie stars Adel Imam and Yousra, popular Muslim televangelist and preacher Amr Khaled, the two sons of President Hosni Mubarak, and thousands of citizens who have said they consider the attack one on Egypt as a whole. Last year was also witness to a ruthless parliamentary election process in which the government’s security apparatus and thugs seemed to spiral out of control. The result, aside from injuries and deaths, was a sweeping win by the ruling party thanks to its own carefully-orchestrated campaign that included vote-rigging, corruption and widespread violence. The opposition was essentially annihilated. 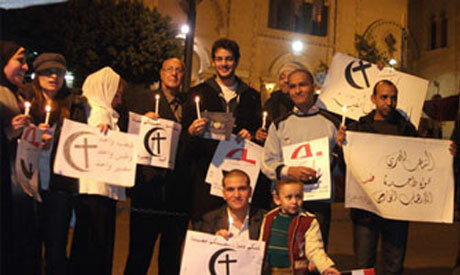 And just days before the elections, Copts - who make up 10 percent of the population - were once again the subject of persecution, when a government moratorium on construction of a Christian community centre resulted in clashes between police and protestors. Two people were left dead and over 100 were detained, facing sentences of up to life in jail. I so appreciate how the Muslims here desired to care for the Christians. I am a Christian who desires all to know Jesus as God's Son. I appreciate the humanity I see displayed here and have grown in my respect and appreciation for the people this represents. This would go further if it was put out to more media. You're using the interpretation of some Fundamentalist Christians in the US. They also claim that Muslims should take Christian and Jews as enemies by not interpreting the passages in the quran or learning the context in which the verses were revealed. If you wish to know what the quran says, I suggest to go to a mosque near you or pick different copies of koran translation plus interpretation because the arabic text is not easy to translate. This has to be the most awesome thing I heard today. this is linked to from TVTropes crowning moment of heartwarming, and rightly so! I have linked to this story on my web site: http://theskepticarena.com/neo's%20favorites.aspx I think it is a disgrace that American media buried one of the greatest stories of all time. Great and Wonderful things have come out of Egypt. This might be another time when they light the way for the rest of the world! We can haggle over any number of concerns with regard to the race or the religion of any people. What is amazing and laudable in this case is that a whole group of people calmly stepped over the gossamer dividing line of religion to show their total love and support for their countrymen.